Monica started her quilt with this section - the house, surrounding star and perfect embroidery. 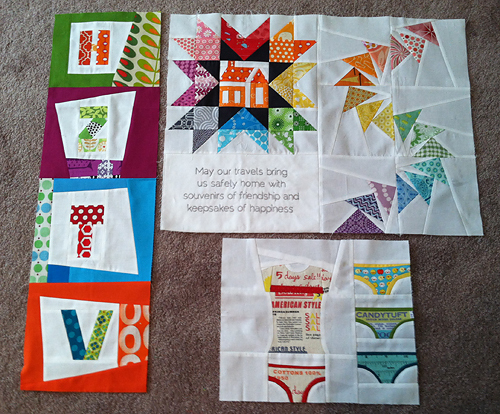 Dan added the Flying Geese, Penny added the undies (can't forget those on your travels! Also a little birdie told me these might be coming out as a pattern in her Sew-Ichigo shop later!) and Jacquie added the HZTV (Happy Zombie TV) section. I decided to carry on with the "Travels" theme and add an airplane! 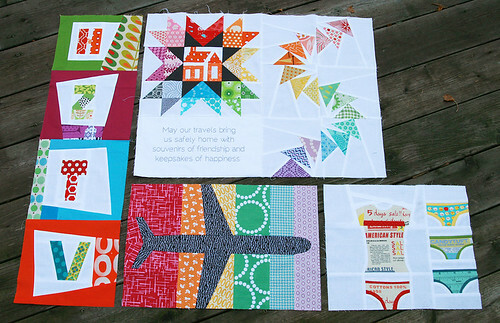 I used Rashida's latest tutorial for the Art Gallery Fat Quarter Gang, Fly With Me. My only issue was I didn't check my scale when I printed it, so everything printed a bit smaller than it was supposed to. It just involved a little extra trimming to make seams match, but wasn't a serious issue. 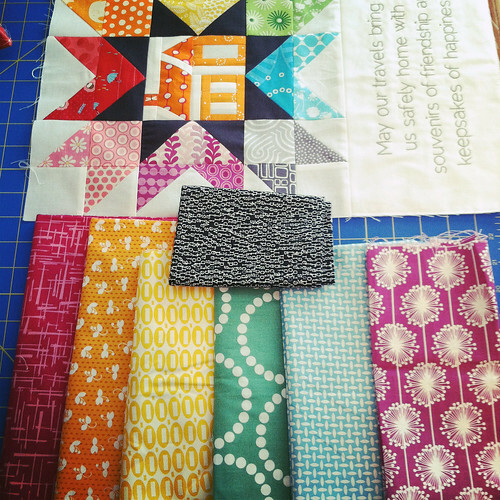 I picked a rainbow of colors to coordinate with Monica's original block. (I switched out the purple at the last minute). 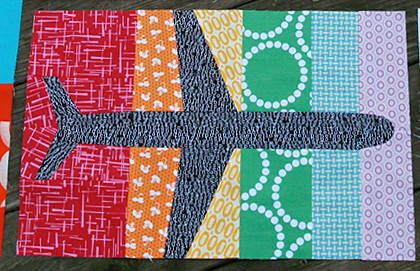 I included some prints from Violet Craft's Madrona Road because I knew Monica and Violet were friends and thought she would like seeing some of that fabric in her quilt. The plane is a black and white text print from my local quilt shop. I hope you enjoy your new block Monica! This quilt is now with Ashley where I'm sure she will add something amazing.